Click HERE to see all upcoming Saunders Medical Center events! Join us at Saunders Medical Center's Skilled and Long Term Care Nursing Home for Several Events Including Fall Festival & Boo In Wahoo! Come visit our residents or short-term stays for those recovering from an illness or injury. Here is the schedule for October 2018! Don't miss our Harvest Festival October 11 from 5-7 pm. 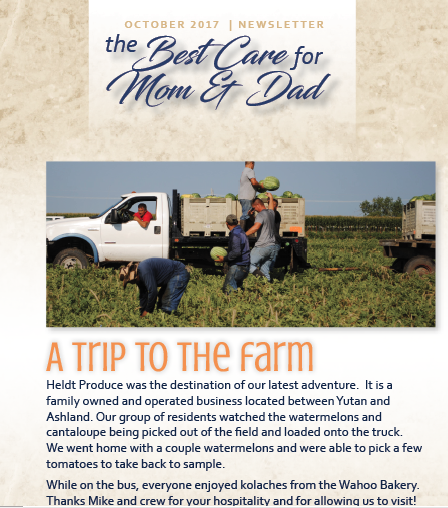 See our "Making a Difference" employee Laura Eivins article too! Public · Hosted by Three Rivers Public Health Department, Sid Dillon and Saunders Medical Center. Join us for great prizes and information! 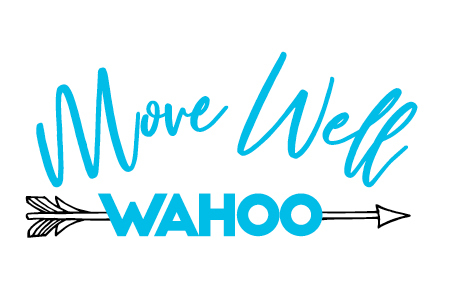 June 2018 LTC Newsletter | Learn what is new at our Skilled and Long Term Care facility. Join us in June! (See our calendar of events or just stop by.) "Making a Difference" features Autumn Waldman, skin check guidelines and information on our Alzheimer's awareness event. Every day can seem like the longest day for individuals living with Alzheimer’s disease, their families, and caregivers. On June 21, the Longest Day of the Year, we will honor these amazing people. Throughout the day, we will host activities to promote awareness, raise funds for the Alzheimer’s Association, and show our love for these amazing people. Check out our Facebook page during the next few weeks for more details on how you can be a part of this very special day at Long Term Care. March is Colon Cancer Awareness month. 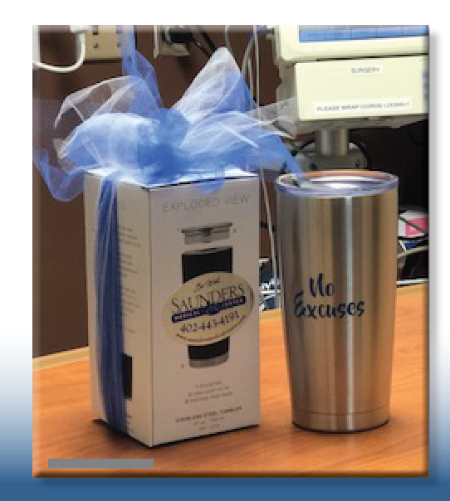 Schedule your screening\colonoscopy and receive a free gift! Call 402 443-1455. These foods all increase inflammation in your body, and the inflammation they cause is associated with a higher chance of developing colon cancer, according to pooled data from two major health studies. If you remember this toy, it's time to discuss screenings. 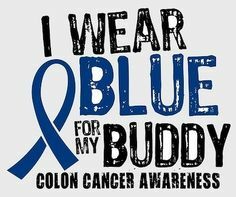 Wear BLUE March 16 to raise awareness of colon cancer in Saunders County Nebraska. Here's why we wear blue: March is Colon Cancer Awareness month. Let's change our numbers Saunders County and get our screenings. Colon Cancer is highly preventable/treatable. Call to schedule your screening today at 402 443-1455. Saunders County: Wear Blue on March 2! Let's change our numbers Saunders County and get our screenings. Colon Cancer is highly preventable/treatable. 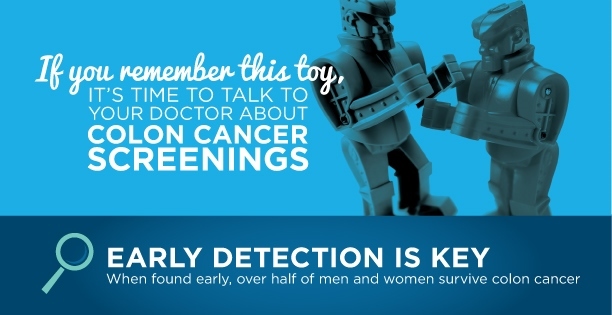 Call to schedule your screening today at 402 443-1455. See the video of the fun had by all who entered and voted at the Ugly Sweater Contest. Residents of the nursing home —Saunders Medical Center's Long Term Care lead the voting for the best one! Dancing, lighting and noise-making sweaters brought smiles to all. The event ended with a parade walk though the rest of the facility to see the hospital and office staff and the Christmas decorations in the lobby. Save the date for our Family Open House: Sunday, Dec. 17 2-4 pm. Come meet our team, learn about the complete therapy services offered and walk through our NEWLY REMODELED & EXPANDED patient areas! Don't forget to get the friends together for the Christmas Light Bus Tour! for more information and to purchase tickets. Or register online! 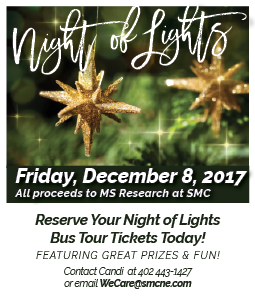 Night of Lights - Christmas Bus Tour Tickets Available! When your child is sick, antibiotics may not be the answer. Work with your child's doctor or nurse at SMC to learn how you can help your child feel better. Be Well. Nationally known speaker coming to SMC! 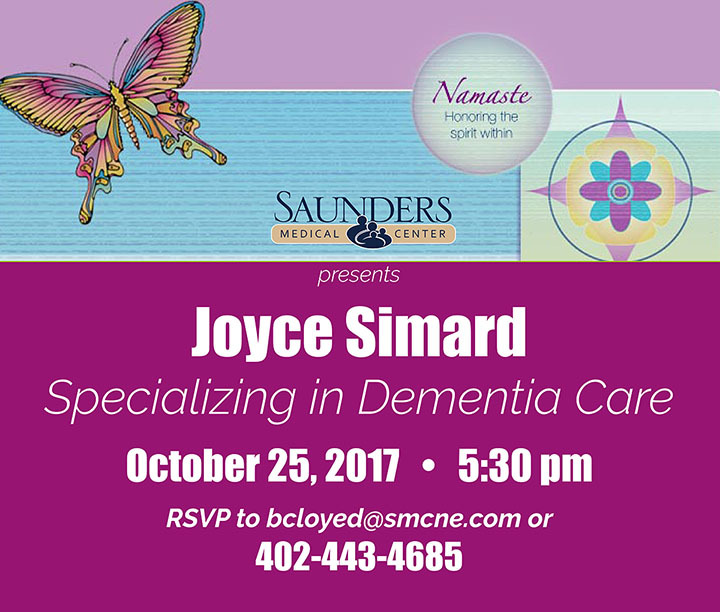 Nationally known speaker Joyce Simard will be speaking and providing training on a variety of subjects, including hospice care, bereavement, comfort care, and activity for people with all stages of dementia. Continuously improving the quality of life for our residents, we want to increase family involvement and create many positive outcomes by implementing Namaste Care at Saunders Medical Center. Joyce’s passion for our seniors will help us to lovingly provide care for those facing advanced dementia. 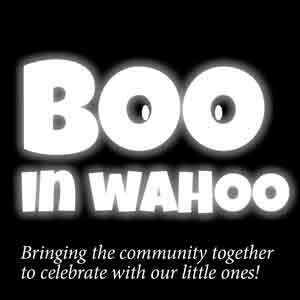 Plan your Halloween at BOO in WahOO! Wishing you a Healthy & Happy Halloween! The Ultimate One-Stop Trick or Treating Event! • FREE Admission! Every child will receive a treat bag. • SMC Long Term Care residents will also be handing out treats! October 2017 LTC Calendar Announced! Come join our nursing home residents for some fun during the month of October! Click to see our latest newsletter and calendar of events.